Happy New Year! Hope this year brings blessings and harmony to us all. During my recent philanthropy trip to Brussels and London last November, I had the opportunity to attend a Romanian Diaspora giving circle event in Brussels with my colleague from the Global Fund for Community Foundations, Wendy Richardson. When Wendy found out that I was traveling in November, she asked if I wanted to attend this community philanthropy event. YES!! Of course! What a wonderful coincidence! We had already been discussing at Dalia within our diaspora philanthropy program to begin experimenting with diaspora philanthropy giving circles. And now I had the opportunity to experience a diaspora giving circle. With the translation support of a young Romanian diaspora professional, I watched as the three Romanian grassroots leaders presented their programs. And then they were asked to leave the room, and the evening’s MC began to mobilize the crowd to support these initiatives. The goal was to raise at least 2000 euros per initiative that night. At the end, they managed to raise over 6000 euros; a successful evening for the first Romanian diaspora giving circle event in Brussels. My colleague, Wendy, wrote a blog about that evening. You can read it here. Please stay tuned as we begin to organize for Palestinian diaspora giving circles. Coming soon! If you are interested in organizing a giving circle in your country, contact me at [email protected]. Last year has been a year of great achievements and learning experiences. It has witnessed the birth of youth led initiatives in different parts of Palestine, including Jerusalem, Gaza, Ramallah and the Jordan Valley. As for the learning journey of the year, it was a mixture of continuous knowledge-gaining from the communities we work with on how to fine-tune our programs to be tailored to their needs and priorities, as well as the training courses we took ourselves for our personal and professional development. I would like to share with you my learning experience in Nepal. Being part of the Foundation for Peace Network, Dalia Association was invited to take part in a month long feminist training course ‘The 22nd South Asian Feminist Capacity Building Course on Gender, Sustainable Livelihoods, Human Rights and Peace’, conducted by Sangat feminist network, and hosted at TEWA community center in Nepal. And what better place could host a feminist training than TEWA?! A truly incredible place with inspirational people. I will be sharing with you my experience in the coming newsletters. The course started by welcoming us with a warm hug, a smile, an Indian shawl, and a candle by the Sangat team, led by the amazing Kamla Bhasin; the incredibly strong, feminist activist, the heart and soul of the feminist network Sangat, and the inspiration of so many women around the world. This warm welcome laid the ground for a truly inspiring course. 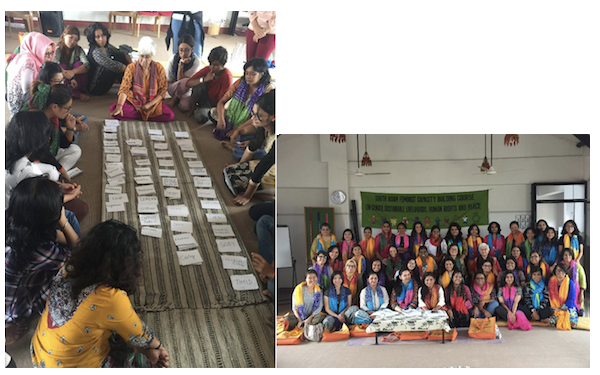 Around thirty-eight amazing feminists and activists from ten different countries took part in this course: Nepal, India, Maldives, Myanmar, Bangladesh, Indonesia, Afghanistan, Sri Lanka, Pakistan, and Palestine. I was the first participant from the Arab world taking the Sangat courses. This made me realize how similar our conditions and circumstances are, and how important it is to connect with the global south and tap into a pool of great resources there, when addressing common challenges, rather than rely on conditional aid coming with specific agendas, that in many cases have a supremist approach on how to “develop” the “third world”. The aim of the course was to widen the network of active women leaders and feminists, and build on their capacities and knowledge, each in her field of work and on a personal level as well. The one-month-long course introduced different subjects from a feminist perspective, deepening our analysis and understanding of their impact on our societies in general, with a specific focus on women. Topics ranged from introducing systems and terminologies (such as gender, feminism, patriarchy, nationalism, and the origins of systems and communities), to sharing experiences, methods and rights to be utilized to advocate for change and support communities facing oppressive cultures and systems. Examples include right to information, care economy, and personal development. Not only did the course include interesting topics and discussions on an intellectual level, it also took us on a transformational journey, reminding us that in order to nourish our energy for activism, we need not forget our physical, emotional and mental wellness, therefore, we practiced yoga and meditation. We were provided a safe space for sharing ones thoughts, feelings and stories, and towards the end of the course, we realized that we became a community of support and inspiration to one another. I came back with a renewed sense of belief and trust in the extremely important work we are doing to shift the power back to communities, through leading the wheel of change and development from the people and by the people. It is with great enthusiasm that I write about the IBDA’ program in the Gaza Strip. Perhaps this is the first time that such a program is being implemented in Gaza. Despite the abundance of youth and development institutions in the Strip, this program particularly focuses on young people to identify their needs and priorities and transform them into initiatives that serve them and their communities to build the local economy. In the first phase, we met with youth groups in all areas of the Gaza Strip to introduce them to the program. The program targets the youth by determining their strengths and identifying available resources, in order to recognize their own needs and priorities, away from the interventions or priorities of the donors or the implementing institution. We have found a significant turnout. However, everyone attending the meetings had many questions, including: "Can we really determine what we need, and what we have? Do we have the right and the ability to use these local resources available to us, yet sidelined for a long period of time, as we suffer from many economic, social and political problems”?! As soon as we started with the implementation of the program, everyone’s thinking shifted: We can do valuable things from very simple resources, and perhaps from nothing, as long as there is faith and will to begin the desired change. The participating youth received training in different matters such as identifying local resources and how to properly use them, local and alternative economy, and writing community social initiatives with a sustainable income. The participants' faith in IBDA’s approach and the vision of Dalia increased: Every individual can offer something to their community, and we can utilize and use our local resources to protect the environment while creating opportunities for youth to work in their society. The attendants of the open meetings, in north and central Gaza, selected four community initiatives. The first initiative in the central Gaza, which operates specifically in Deir el Balah is Deirna Store. It aims to recycle wooden pallets for the production of home furniture and decorations. They also use old tires and plastic containers to decorate gardens and kindergartens. The second initiative is Diala Style, which works specifically in Nusseirat. In the beginning, the idea was to design clothes and commission a tailor to produce the design, and then exhibit them in local stores, but later the initiative was modified to become a sewing factory, that sews their designs according to customer requests. The third initiative, Happy Zone, in northern Gaza, specifically in the Tel Za'tar, focuses on the production of handicrafts and products that are not made in the Gaza market, yet are needed such as baby cots and desk laptops. They also have some beautiful products such as handmade paper gifts and the locally designed “butterfly effect” agenda. The fourth initiative is Wood Crafts in Jabalia, which produces interior decor using recycled wooden pallets. The leaders of the four initiatives, aged 20-26, faced a lot of difficulties and obstacles, considering the awful situation and the blockade in Gaza. However, at the end of the year 2017, and after constant moral and technical support from Dalia, we organized a closing ceremony of their initiatives, in an effort to expose their works to other people in the Strip. I am so proud to be a part of Dalia’s family, and I get happier every day when I witness the change the IBDA’ program has achieved, for it changed attitudes and behaviors of Gazan youth, by searching for local resources, cash and non-cash, and mobilizing them towards their own needs and priorities that serves their communities, always taking into consideration materials that are environmentally friendly. They have planted the seed of hope. They have become more accountable and transparent, because there are committees that follow up on their initiatives and their proper implementation to serve their community. We organized a series of trainings and workshops for the students of the Orthodox School of Bethany in Al Eizariyeh. The first one, included training with Ala' Hilu from Resign for Recycling Design on upcycling and recycling waste materials. Jihad Shujayeh also gave the students training on volunteerism, and community development. Team Dalia led sessions focusing on the local economy and the social lean canvas model. The leader of the “Ma Kan Fi W Hala Fi” initiative (there was nothing, and now there is everything) in Arab Al Jahaleen Bedouin community, held an open day to celebrate and launch her newly established mobile food kiosk, designed by Ala’ Hilu from Resign for Recycling Design. Her initiative focuses on raising awareness of the children in the community through cultural and recreational activities. The food kiosk will provide healthy meals, while generating income for cultural and educational activities. During the day, she organized games for the participating children, and showed the children how to recycle carton and paper. The leaders of the initiative "Kayyef Nafsak" are active. The initiative focuses on creating a community school (extracurricular activities) that benefits children and other members of the community in Eizariyeh, Abu Dis, and East Sawahreh. They aim to create space for recreational activities to support the community. 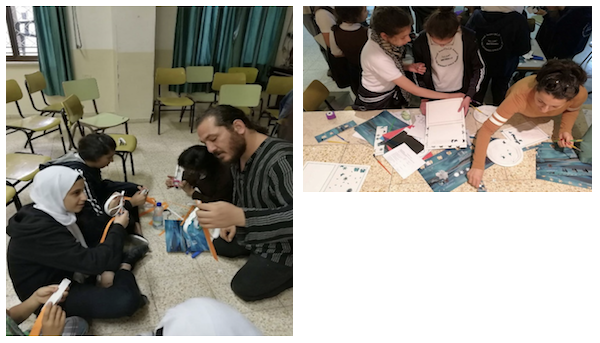 They have held multiple workshops with children and teachers on different matters such as using drama to discuss social issues in Palestine, and designing creative educational tools. We also organized another series of trainings and workshops with the students of the Ramallah Friends Boys School. The first one included a training on community philanthropy, the international aid system, and the holistic approach towards community development, including social, cultural, environmental, and local economy. The second workshop focused on needs assessments of community issues and problems. In the last training, the students began to identify ideas for initiatives that they will implement before the end of the school year. The Youth from the IBDA’ program in Gaza, along with Nermin from team Dalia, held an open day in order to learn and grow from other initiatives in the city. The first stop included the mushroom farm by the agroecologist Eman Radi. She plants these mushrooms in a fully equipped room in her apartment. Her initiative is very successful as she has many customers lining up to buy her mushrooms. The second stop was the Islamic university to learn more from the business and technology forum, as they have been providing services for entrepreneurs and small projects for over 10 years. They met with Sumaya Susi who elaborated on her project of creating furniture with multiple uses for small spaces. They also met Aya Kishko, who talked more about her project of recycling wooden pallets for home use items. Both of them expanded on the difficulties they faced, and they gave advice on how to overcome such difficulties. They later visited the Deer Color initiative and the leader, Ahmad Al Sahar, elaborated on the process of establishing his idea. He said that he faced many failures before reaching this point of success. His initiative mobilizes local resources in Gaza to create colors. He uses Gaza’s sand and grinds it with different chemical equations to achieve the desired colors. His products are currently competing other merchandises of the same nature. The next stop they visited rooftop gardens in Al Bureij in central Gaza. As this initiative aims to make use of roofs and mobilize them towards food production and self-sustainability. They ended the day with a visit to Al Bayara Community Park, in Deir Al Balah in central Gaza. This park provides a safe space for children and their mothers to spend their time doing leisurely and recreational activities. The park is built by using recycled car tires, car frames and wooden pallets. Click here for more photos of the visit. In December, Dalia conducted a field visit to Bethlehem district with the participation of two of our youth initiatives from the IBDA’ program: “Ma Kan Fi W Hala Fi”, and “Kayyef Nafsak”. The tour included visiting other youth initiatives and community centers, in addition to hiking the natures of Husan village. There, we visited a center for people with disabilities, providing vocational training services for the disabled, among which are recycling workshops and the production of recycled papers. We then continued our hike to Hawiya spring, where we saw how they practice traditional seasonal farming techniques, in addition to the traditional irrigation system that contributes to strengthening cooperation and a sense of community among farmers in the area. 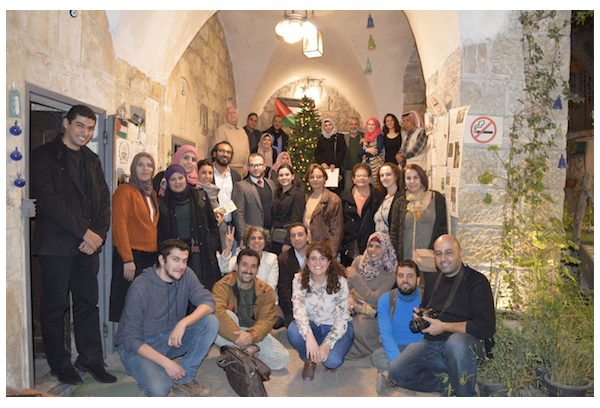 We proceeded with our trip by joining a cultural art walk in the old town of Beit Sahour, organized by MishwArt. In the walk, we came across incredible youth initiatives in the arts, who are independent from the international and conditional aid system: Art Salon, Resign for Recycling Design, Dar Al Musica, and a local Instrument maker. We enjoyed a delicious meal at Azzeh refugee camp, prepared by Kawthar and her family. Kawthar offers cooking classes for local, seasonal and healthy meals. Our last stop included visiting the “Reefyat Zeinab” initiative, where they make accessories from locally available resources such as dates and olive pits. They also produce coffee made from date pits. 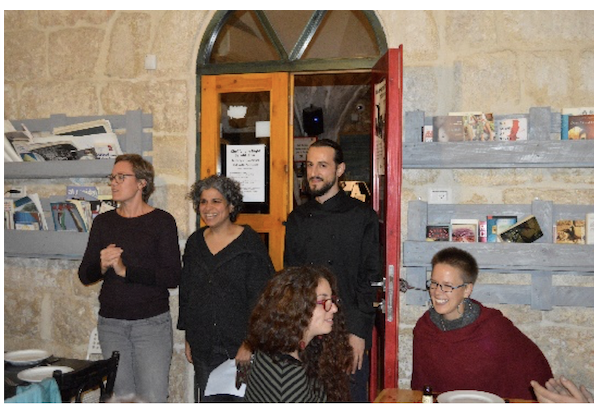 Dalia organized an open house to give thanks to all its volunteers, donors, and believers in Dalia's mission of a Palestinian controlled development. The event included an introduction to the initiatives: "Kayyef Nafsak" and "Ma kan Fi W Hala fi", as well as a distribution of certificates, and a film screening. After the introductions, the guests spent their time shopping at the local market, potting plants, and making Christmas decorations. Team Dalia held several meetings in November with the Ramallah, Tulkarm, Jenin and Salfit Women Funds. In the meetings, the women discussed the current projects supported by their funds, and the possibility of opening membership for other women cooperatives from these regions to join. Make a Difference with your food! 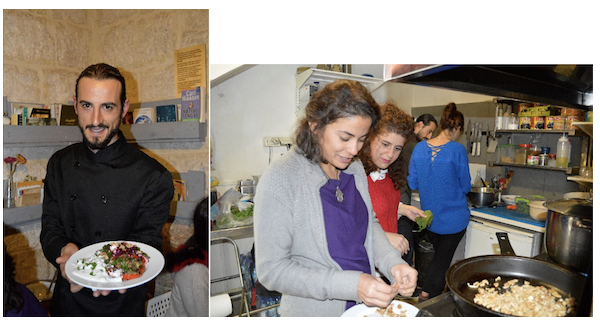 Singer Café, in Beit Sahour, hosted Dalia for a dinner to launch our first ever donation box for the Dalia Association. On top of that, we had the dexterous chef Izzeldin Bukhari, the founder of the Sacred Cuisine, cooking the dinner for us! The menu for positive social change included lentil soup, a quinoa and beet salad, and open-faced stuffed peppers. All profits from this event have been donated to Dalia’s community controlled grant making programs, which ensures a strong Palestinian civil society. Zeinab Samarah is from Ramallah, she holds a Diploma in Office Management. 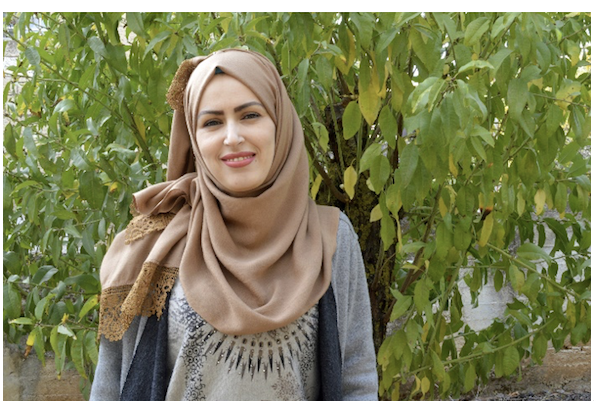 She is currently pursuing her education in Business Management at Al Quds Open University. She has 11 years of experience in office management, as she held different managerial positions such as the Palestine Capital Market Authority, as well as The Palestinian Center for the Independence of the Judiciary and the Legal Profession- “Musawa”. 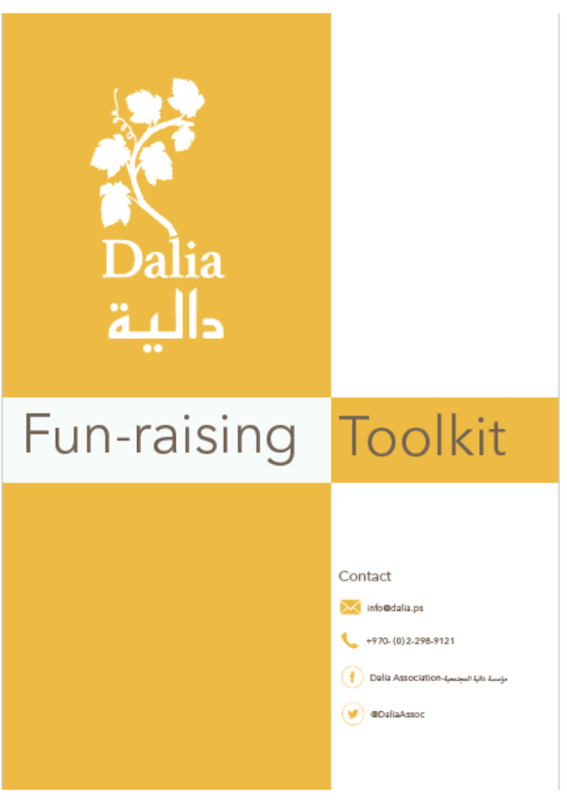 We want to share with you our new fun-raising toolkit. Yes, the “d” was dropped in “fundraising” because the key is to have fun! Come on, be a part of the movement! A movement where Palestinian people come together and decide on their priorities to achieve their own durable and sustainable development. Team Dalia and the entire Dalia Family wish you all a wonderful new year full of community giving (Al Ouna) and a flourishing local economy!